For the fourth time in eight years, the all-time record for total shutouts in a season was shattered, as 192 shutouts were recorded. The 2003–04 regular season was also the first one (excluding the lockout-shortened 1994–95 season) since 1967–68 in which there was neither a 50-goal scorer, nor a 100-point scorer. This was the final season that ABC and ESPN televised NHL games. It was also the final NHL season before the 2004–05 NHL lockout, and the final season in which games could end in ties. The schedule of 82 games was revamped. The 30 teams played 82 games in a revamped format that increased divisional games from five to six per team (24 total), conference games from three to four (40 total), and decreased inter-conference games to at least one per team, with three extra games (18 in total). The alternating of jerseys was changed. For the first season since the 1969–70 season, teams would now wear their colored jerseys at home and white jerseys away. The Phoenix Coyotes moved to a new arena in Glendale, Arizona, after playing their first seven seasons at America West Arena. The 2003–04 season was one overhung by concern over the expiry of the NHL Collective Bargaining Agreement. It would lead to the cancellation of the League's games for the entirety of the next season. During the entire season, NHL Commissioner Gary Bettman and NHL Players' Association (NHLPA) head Bob Goodenow waged a war of words with no agreement being signed. On September 26, just before the season was to begin, young Atlanta Thrashers star Dany Heatley crashed his Ferrari in suburban Atlanta. The passenger, Thrashers teammate Dan Snyder, was killed. Heatley himself was badly injured and eventually charged with vehicular homicide. 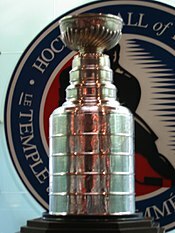 Entering the season, the two Stanley Cup favorites were the Ottawa Senators in the Eastern Conference, who had won the Presidents' Trophy and come within a win of the Stanley Cup Finals the year before, and the Colorado Avalanche in the Western Conference, who, despite losing legendary goaltender Patrick Roy to retirement, added both Teemu Selanne and Paul Kariya to an already star-studded lineup. Neither of these teams, however, were as successful as expected, with Ottawa finishing fifth in their conference and Colorado finishing fourth, losing the Northwest Division title for the first time in a decade when the franchise was still known as the Quebec Nordiques. The greatest disappointments were the Mighty Ducks of Anaheim, who, despite making it to Game 7 of the Stanley Cup Finals the year prior and adding both Sergei Fedorov and Vaclav Prospal, failed to make the playoffs. The Los Angeles Kings failed to make the playoffs in large part due to a season-ending 11-game losing streak. In the East, the star-studded New York Rangers again failed to make the playoffs. The Washington Capitals, who were regarded as a contender, also stumbled early in the season and never recovered. The end of the season saw two of the most extensive housecleanings in League history, as the Rangers and Capitals traded away many of their stars and entered "rebuilding mode." The Capitals traded away Jaromir Jagr, Peter Bondra, Sergei Gonchar, Robert Lang and Anson Carter, while the Rangers moved Petr Nedved, Brian Leetch, Anson Carter and Alexei Kovalev to other NHL teams. The most surprising teams were the Tampa Bay Lightning in the East and the San Jose Sharks in the West. The Lightning, who had a remarkable season with only 20 man-games lost to injury, finished atop the Eastern Conference, while the Sharks, who were firmly in rebuilding mode after a disastrous 28–37–9–8 campaign the last season, came second in the West and won the Pacific Division. Two other teams that did better than expected were carried by surprising young goaltenders. The Calgary Flames ended a seven-year playoff drought backed by the solid play of Miikka Kiprusoff, and the Boston Bruins won the Northeast Division by a whisker over the Toronto Maple Leafs with the help of eventual Calder Memorial Trophy-winning goaltender Andrew Raycroft. Goaltending was also the story of the Presidents' Trophy-winning Detroit Red Wings as the return from retirement of legend Dominik Hasek bumped Curtis Joseph to the minor leagues. At the same time, long-time back up Manny Legace recorded better numbers than both veterans and won the starting job in the playoffs. Of note is the fact that the Nashville Predators made the playoffs for the first time in franchise history, though they were dispatched by a star-studded Detroit Red Wings team in the first round. The regular season ended controversially, when in March 2004, the Vancouver Canucks' Todd Bertuzzi infamously attacked and severely injured the Colorado Avalanche's Steve Moore, forcing the latter to eventually retire. Detroit Red Wings won the Presidents' Trophy and home-ice advantage throughout the playoffs. For rankings in conference, division leaders are automatically ranked 1–3. These three, plus the next five teams in the conference standings, earn playoff berths at the end of the season. The 2004 playoffs were considered to be wide open, with no clear favorite. All of the top teams had weaknesses. Tampa Bay and Boston were both young teams with no history of recent postseason success. Detroit, Ottawa, Colorado, and Philadelphia all had major questions in goal. New Jersey was marred by injuries to Scott Stevens and Brian Rafalski, while Vancouver was missing the suspended Todd Bertuzzi. The Calgary Flames, a sixth seed, defeated the Canucks, the Red Wings and the Sharks to become the first Canadian team to reach the Stanley Cup Finals in ten years, since the Canucks lost to the Rangers in 1994. They faced the Tampa Bay Lightning, who defeated the Islanders in five, swept the Canadiens and defeated the Flyers in seven games. The Lightning beat the Flames in the Stanley Cup Finals, four games to three. With the Flames having a 3–2 series lead and the series going back to Calgary for Game 6, with the Stanley Cup in the building and with the game tied 2–2 in the third, Martin Gelinas of the Flames (who scored the series-winning goals in the Flames' three previous series) appeared to have scored the go-ahead goal. Gelinas redirected a pass towards the Tampa net using his skate that was kicked out by Lightning goaltender Nikolai Khabibulin. It appeared that before Khabibulin kicked the puck out, it had already crossed the goal line. The play was not reviewed. To this day, many Flames fans argue that the puck was in. The game eventually went into double overtime, where Lightning winger and former Flame Martin St. Louis scored the overtime winner. The Lightning went on to win Game 7 by a score of 2–1 and captured their first championship in franchise history. Brad Richards, with 12 goals and 26 points in the playoffs, won the Conn Smythe Trophy as playoff MVP. Valeri Bure Dallas Stars Olympic silver and bronze medalist, 1-time NHL All-Star. Shayne Corson Dallas Stars 3-time NHL All-Star, over 1100 games played. Vincent Damphousse San Jose Sharks 1-time Stanley Cup champion with the Montreal Canadiens, 4-time NHL All-Star, over 1300 games played. Ron Francis Toronto Maple Leafs 2-time Stanley Cup champion with the Pittsburgh Penguins, 4-time NHL All-Star, 3-time Lady Byng Trophy, Frank J. Selke Trophy winner, King Clancy Memorial Trophy winner, over 1700 games played. Kenny Jonsson New York Islanders 2-time Olympic gold medalist, 1-time NHL All-Star. Joe Juneau Montreal Canadiens Olympic silver medalist. Mike Keane Vancouver Canucks 3-time Stanley Cup champion with the Montreal Canadiens, Colorado Avalanche and Dallas Stars, over 1100 games played. Igor Larionov New Jersey Devils 3-time Stanley Cup champion with the Detroit Red Wings, 2-time Olympic gold and bronze medalist. Curtis Leschyshyn Ottawa Senators 1-time Stanley Cup champion with the Colorado Avalanche, over 1000 games played. Al MacInnis St. Louis Blues 1-time Stanley Cup champion with the Calgary Flames, Olympic gold medalist, 7-time NHL All-Star, Conn Smythe Trophy winner, James Norris Memorial Trophy winner, over 1400 games played. Mark Messier New York Rangers 6-time Stanley Cup champion with the Edmonton Oilers and Rangers, 15-time NHL All-Star, Conn Smythe Trophy winner, Hart Memorial Trophy winner, Lester B. Pearson Award winner, over 1700 games played. Last active player to play in the World Hockey Association and the last active player to have played in the 1970s. Adam Oates Edmonton Oilers 5-time NHL All-Star, over 1300 games played. James Patrick Buffalo Sabres Over 1200 games played. Felix Potvin Boston Bruins 2-time NHL All-Star. Rob Ray Ottawa Senators King Clancy Memorial Trophy winner, NHL Foundation Player Award winner. Scott Stevens New Jersey Devils 3-time Stanley Cup champion with the Devils, 13-time NHL All-Star, Conn Smythe Trophy winner, over 1600 games played. Steve Thomas Detroit Red Wings Over 1200 games played. Roman Turek Calgary Flames 1-time Stanley Cup champion with the Dallas Stars, 2-time William M. Jennings Trophy winner, 1-time NHL All-Star. ^ a b "2003-04 NHL Summary - Hockey-Reference.com". Hockey-Reference.com. Archived from the original on April 19, 2018. Retrieved May 9, 2018. ^ "1967-68 NHL Summary - Hockey-Reference.com". Hockey-Reference.com. Archived from the original on June 16, 2017. Retrieved May 9, 2018. ^ a b c d e f "2003-2004 Division Standings". National Hockey League. Retrieved March 26, 2012. ^ a b "2003–2004 Standings by Conference". National Hockey League. Retrieved March 26, 2012. ^ TheXen0 (September 2, 2009). "Martin Gelinas Phantom Goal, Did The Puck Go In?". Archived from the original on June 17, 2016. Retrieved May 9, 2018 – via YouTube. ^ Dinger, Ralph, ed. (2009). The National Hockey League Official Guide & Record Book/2010. Dan Diamond & Associates. p. 162. ^ "Former Hab Valeri Bure now has his own wine label". montrealgazette.com. February 26, 2014. Archived from the original on October 14, 2017. Retrieved May 9, 2018. ^ nurun.com. "Shayne Corson speaks out about colitis". Napanee Guide. Retrieved May 9, 2018. ^ "Criminal charges dropped against former Hab Vincent Damphousse's ex-wife - CBC News". cbc.ca. Archived from the original on October 1, 2016. Retrieved May 9, 2018. ^ "Ron Francis to have number retired by Carolina". sootoday.com. Archived from the original on December 20, 2016. Retrieved May 9, 2018. ^ "Former Toronto Maple Leafs defenceman Kenny Jonsson retires". NHL.com. Archived from the original on September 16, 2016. Retrieved May 9, 2018. ^ "Where are they now? Joe Juneau - Historical Website of the Montreal Canadiens". ourhistory.canadiens.com. Archived from the original on September 14, 2016. Retrieved May 9, 2018. ^ "Former Star Mike Keane Expected to Retire". defendingbigd.com. Archived from the original on October 1, 2016. Retrieved May 9, 2018. ^ MacIntyre, Iain. "Igor Larionov's take on NHL lockout? 'We can’t afford to lose another season'". vancouversun.com. Archived from the original on December 20, 2016. Retrieved May 9, 2018. ^ "Curtis Leschyshyn Retires". NHL.com. Archived from the original on May 19, 2017. Retrieved May 9, 2018. ^ "Hard-shooting defenseman Al MacInnis retires". ESPN.com. September 9, 2005. Archived from the original on September 15, 2016. Retrieved May 9, 2018. ^ "No more Mess: NHL great retires after 25 seasons". ESPN.com. September 12, 2005. Archived from the original on April 29, 2018. Retrieved May 9, 2018. ^ "OATES RETIRES FROM NHL". highbeam.com. April 5, 2004. Archived from the original on December 9, 2017. Retrieved May 9, 2018. ^ "James Patrick retires from NHL - CBC Sports". cbc.ca. Archived from the original on October 1, 2016. Retrieved May 9, 2018. ^ "NHL lockout leaves the old guys behind". nationalpost.com. November 27, 2012. Retrieved May 9, 2018. ^ Press, The Canadian. "Retired Buffalo Sabres enforcer Rob Ray sues NHLPA, again - The Hockey News". thehockeynews.com. Archived from the original on May 19, 2017. Retrieved May 9, 2018. ^ "Stevens retires after 22 years". ESPN.com. September 6, 2005. Archived from the original on September 15, 2016. Retrieved May 9, 2018. ^ "FROM THE ICE Steve Thomas reportedly talking to other teams". todaysslapshot.com. Archived from the original on October 9, 2016. Retrieved May 9, 2018. ^ "Wednesday roundup: Turek retires from Flames, NHL". ESPN.com. August 10, 2005. Archived from the original on May 9, 2018. Retrieved May 9, 2018.